In this activity, students construct their own pinhole camera to observe the behavior of light. Optical engineers need to understand how light rays work in order to design and create devices such as cameras, lasers and fiber optics. All 100, 000+ K-12 STEM standards covered in TeachEngineering are collected, maintained and packaged by the Achievement Standard Network (ASN), a project of JES & Co. (www.jesandco.org). Click on the standard groupings to explore this hierarchy as it applies to this document. Understand how light rays travel in straight lines are used in the processing of images. Use light rays to create a photographic image. 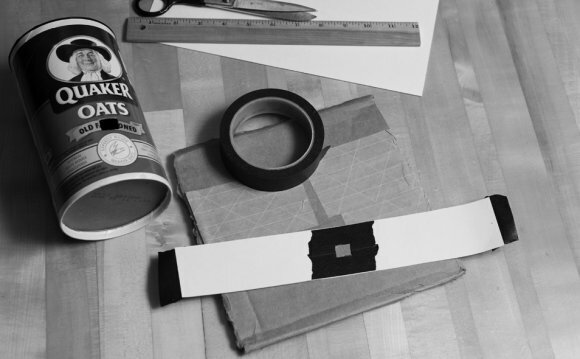 Explain the basics of how a pinhole camera works. Students, this is the very last activity in our sound and light unit. You have all done a great job learning about sound and light and how engineers use their knowledge of sound and light to help improve our world. Today we are going to create something really neat – our own little cameras! We learned in our lesson that light travels in straight lines and is inverted when it passes through a small hole. Today we are going to see this principal in action. Let's create a camera! Hundreds of years ago, images were etched in stone and later, with the advancement of modernization, onto various types of cloth or even paper. At this point, these images might actually have been paintings of landscapes, portraits or still life (such as a bowl of fruit or a plant). By definition, a picture is a precise copy of an image — a duplicate image, not just a redrawn copy. So, before the creation of what we know today as digital cameras (or film cameras, which are still widely in use), what did people do to have a copy of a certain image? Well, in the mid 1600s, a dark room, also know as a dark chamber or camera obscura, was cleverly used to transfer an outside image onto paper inside a room. To explain, a large room has a hole in one of the walls. When lights enters the small hole, the outside image is reflected onto the opposite wall. An artist, standing in the room, would then draw the image as it appears on the wall onto paper. What is a pinhole camera & how does it work?